Gorgeous canvas giclee print based on the Indiana Jones films. A limited edition of 50 pieces! The man in the hat is back! Indiana Jones, Professor of Archeology, on a quest for fortune and glory! This Indiana Jones the Man in the Hat Canvas Giclee Print features a stylized image of the good Dr. Jones as he exits an ancient tomb. 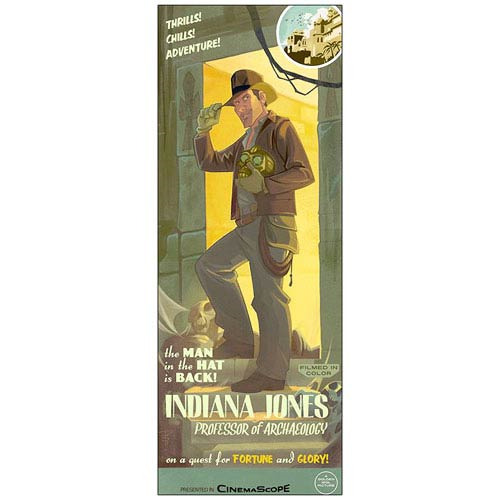 Promising thrills, chills, and adventure, this great giclee print is like a cool advertisement for the adventures of Indiana Jones that have been printed in color and presented in CinemaScope, a Golden Idol picture. This fantastic giclee measures 24-inches tall x 9-inches wide, has been printed on canvas, and is a limited edition of just 50 pieces!